Eventually, by merging all the minor systems, our Inventory System will be working just like the video above. Throughout the tutorial I’ve used some very basic Assets. You can download them from here. Moreover, you can find all the source code of this tutorial here. Add a new C++ class based on the Actor class and name it Pickup. The SetGlowEffect function will make sure to highlight the static mesh of our pickup. This will work when we setup our Post Process effect in the Editor. Switch to your Editor and create some pickup classes. I’ve created 3 pickups each with a different static mesh and item texture. Everything is included in the .zip file at the start of the post. Before we setup our Post Process we need to make sure we have the right material in order for our items to Glow. For my project, I’ve used the material named M_Highlight from 4.8 version of Content Examples of UE4. In case you don’t have this version, the material is included inside the ziped file at the start of the post. To add the downloaded material inside your project, close your Editor and copy the file inside the Content folder of your project. Then open up your project and the material will be where you’ve copied it. Mark your Post Process volume as Unbound. That’s it. We’re done with our Post Process. Let’s move on to our character setup in order to complete the Glowing effect! Don’t forget to add the “Pickup.h” include right before the .generated.h file. When you’re done with that, create a Blueprint based on your Pickup class and place it somewhere in your Level. Then, test if the glowing effect works as intented. Since we will attach UMG to our Inventory later on, we need to create a somewhat hardcoded value for the total number of the items that a character can pick up. However, by defining a value and use that instead of a hardcoded value is somewhat more flexible for future use. In case the Inventory is full and there isn’t a nullptr Item inside our inventory the Inventory.Find function will return INDEX_NONE instead of the AvailableSlot. In this case, this means that the engine is telling you that your TArray of items doesn’t have an available slot for a new item. Right now you have the pickup functionality of you inventory. 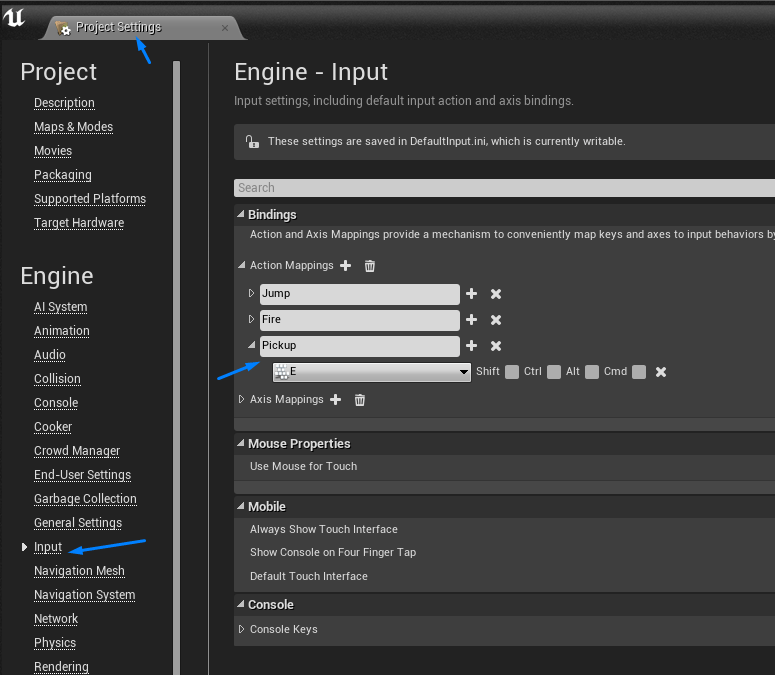 Place a couple of pickups inside your map and test it and make sure their default static mesh/materials are different. The Inventory is exposed so you can test what’s happening inside your inventory from within the editor! When you’re done with that add a Blueprint Game Mode and named it BP_MyGameMode. In this case we need the game mode just to tie the controller and the character together. Since we won’t need any C++ for that we will add a blueprint instead. Now that you have completed this step, go to your map and inside the World Settings assign the BP_GameMode. //If the item is valid update the widget's texture. We’re done with our Inventory Slot Widget, for now at least! Save and compile your code. After that, create a Blueprint based on the Inventory User Widget and name it UW_Inventory. Again, I know it doesn’t look like much, but bear with me! We’re done with the Inventory Widget for now. Go to your Editor and specify a new Action Mapping named Inventory. Don’t compile your code yet because we have yet to write the HandleInventoryInput function for our controller. Don’t forget to include the “InventoryWidget.h” file. Change the line 15 to match your character! Save and compile your code! At this step we’re ready to test our code. Place some BP_Pickups inside your level and don’t forget to setup a texture for each and every one of them. Otherwise you will not be able to see your Pickup’s Texture! Since we have the base functionality we now need to update our code. In the next section we’re going to implement a Pause system so that the game won’t continue until you either close the inventory or select an item. With the above code we have achieved the Pause and unpause as well as showing and hiding the cursor of our game. You should compile, save and test your code at this state! Let’s move on and create the logic for our Inventory Slot Click status. For this case, we won’t create a system that will make our Character actually equip our awesome cubes. However we will create a basic Equip functionality just for demonstration purposes. //every pickup has a unique texture. //Texture image we're passing as a parameter we mark that item as CurrentlyEquipped. Don’t forget to include the Character.h file and replace my character’s class to fit your needs. Save and compile your Blueprint. You now have an Equip functionality! In this post we’re going to create a drop functionality. Specifically, the character will be able to drop the currently equipped item. Let’s start! The binding inside the SetupPlayerInputComponent that points to the above function! If you’ve made it so far, I would like to thank you for reading my tutorial! Have fun! In the function “DropEquippedItem(),”int32 IndexOfItemhe” haven’t be initialized,how it is works? Hello, I’m not initializing the IndexOfItem variable because right after, I’m calling the Find function which exists in all TArrays. This function searches your specified array for a given item (in this case the CurrentlyEquippedItem). If the item exists inside the array, the Find function will return true and will modify the second parameter (in this case IndexOfItem) to match the index of the found item. However, if it failed to locate the given item inside your TArray, it will return false. Having said, since we’re using an if statement we have no need to initialize our variable because the Find function will take care of that. 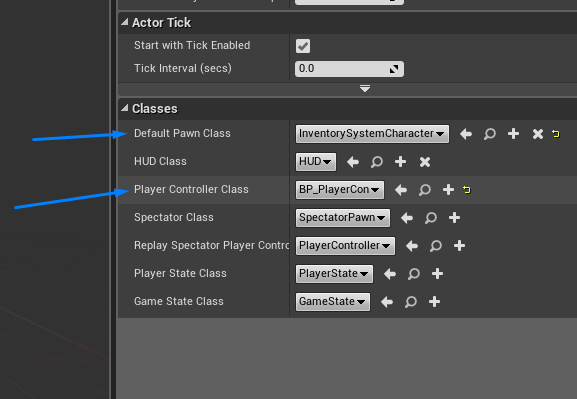 In this tutorial,your make a particular actor -“PickupActor”-for pick up.But in the real game world ,should we need let the “Pickupactor” to be the Baseclass of the whole actor or using interface ? Yes. In fact, notice that we created only one class (the pickup class) and then we created different Blueprints derived from our pickup. This means that we used the pickup class as a Base class. I would use the interface approach only if my game demanded it. For example, imagine that you’re building World of Warcraft. WoW has a vast variaty of items, like inventory items, collectable items, cosmetic items and so on. That said, in my opinion an interface approach would offer a more flexible solution. When i create a blueprint derived from the InventorySlotWidget C++ class, i open it up, but there is no designer tab… help? That’s weird, can you provide a screenshot of your Blueprint? Rather than creating a blueprint derived from your custom C++ widget class you create a new widget blueprint (not derived from anything), open the widget blueprint, select class settings, then parent class. Alex, I cannot reproduce your bug both in 4.11 and 4.12. Have you tried deleting and recreating a Blueprint based on your c++ user widget? Yes, several times… maybe the C++ class’ parent class could be Widget Component instead of User Widget? You need to inherit the User Widget class since we’re not creating a widget component. Have you tried to reproduce your bug in an empty project? That’s strange, if you are not able to open up the designer tab at all in any projects, could it be that there’s something wrong with the installed version of the engine? I think you should open up a thread on answershub and describe your issue. 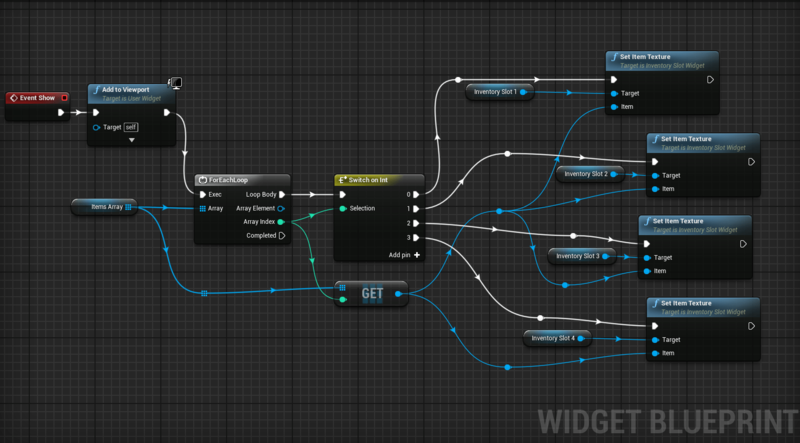 I understand that this is frustrating since you can’t complete the tutorial so I suggest (as a temporary workaround) to create a Blueprint user widget and transfer the logic of the widget to a Blueprint functions library which will be written in C++. Ok will do 😉 thanks for the support though, keep it up! on “Setting up our Character” do we create a new “Character” C++ class? I’ll check on that, but wouldn’t it still be possible for the raycast to return anything at all if I ignore the player (There are other meshes in the level too)? I followed the tutorial and everything works except for the textures are not showing up on my widgets, they are always staying as white boxes no matter what items I pickup or drop. 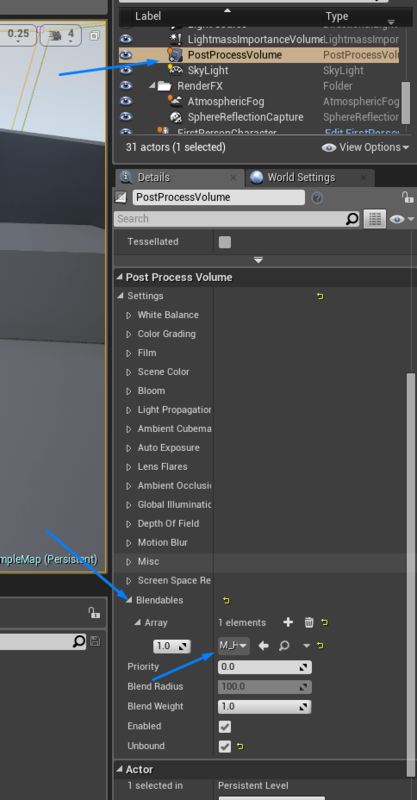 I am new to UI in unreal so I basically had to guess based off the screenshot and I probably have conflicting layer render issue.. but its impossible to know. I’m using a Canvas Panel as a root for my UI. Then, I created a Uniform Grid Panel which contains all the inventory widgets. This control makes sure that each inventory widget has the same space in your UI. Inside the Panel I’ve placed the widgets that you see in the screenshot. Since you’re having the desired functionality but you’re not seeing any textures this means that your Blueprint cannot find a valid texture so it remains at the default texture (white in this case). Have you checked your Brush binding and your SetTexture assignments? Moreover, make sure to provide a valid texture for each item. Update: It’s unlikely to have a layer render issue because the Add to Viewport node places your UI 10 layers above your top layer (this is done inside the engine code). Can you tell what is going on from these screenshots? Hey Max, I’m glad you solved your problem! First off thanks for the tutorial, it’s greatly appreciated. I’ve implemented the pickup function and it successfully adds the item to my inventory. However, from a BP I’m attempting to get the name of the item which is stored in inventory location 0. I am getting the following error in the message log. This makes sense in that I’m storing a reference to an actor that was just destroyed and is pending garage collecion. I’m curious if you get the same message in your game. since the item is an actor it must exist in the world, in other words it has to be spawned to hold a reference to it’s instance. Otherwise, you’d have to store it’s class and not the actor reference. The behavior you’re describing seems correct (however I cannot remember if I’ve encountered the same problem). The workaround in your case would be to set the visibility of your world item to false and disable its collision. Since you’re still having a valid reference to that item (through your array), the engine’s GC won’t mark your item as pending kill and the player won’t be blocked by that item. Hey there, I’ve just finished the part right before you implement the pause state. Unfortunately I’ve got a problem. Whenever I pick an item, the image of the item appears but the image in the inventory slot doesn’t change size to fit the button, so all that ends up showing up in the button is the top left corner of the image. Is there anyway to fix this? Also for anyone in the future RemoveFromViewport no longer works, use InventoryWidgetRef->RemoveFromParent(); instead. Have you set the horizontal and vertical alignment of the image element to stretch (red marker in this screenshot: http://prntscr.com/dws2pf) ? Thank you for still replying so late after you posted the article. MaxPro (a few comments above) encountered the same issue and stated that it was fixed by adjusting the buttons scale really low to match the size of the ones inside his grid panel. Can you give this workaround a go to see if this works for you? I can’t really change the size of the slot now if I want to make a bigger one, but it’ll do for now. Thanks for your help, I look forward to following more of your tutorials in the future. I ended up fixing this by removing the “Canvas Panel” from this picture. Can’t save C:/Users/User/Documents/Unreal Projects/MyProject9/Content/FirstPersonCPP/Maps/FirstPersonExampleMap.umap: Graph is linked to private object(s) in an external package. I heard some people say going to file while inside your blueprint and selecting “Refresh all nodes” can fix this. But this error can happen for multiple reasons. It comes and goes for me all the time. So I can get everything but the UI/UMG to work for this tutorial in 3rd person template. I understand the tutorial is made for the First Person template and I will do it in 1st person tomorrow night. I am just curios as to why the UI/UMG isn’t rendering, are there drastic differences in those templates when it comes to UMG/UI or am I possible horribly overlooking something? Also thanks for three tutorials they have been a nice intro to UE4 from Unity. I suggest to go over your code once again. Seems like you have overlooked something. Ended up being an error in my UE install. A reinstall was needed to clear the issue. Hey Orfeas, thanks for all these tutorials! I got one one question. Where is function GetInventory() defined? I can’t compile my code cuz of Character class doesn’t have GetInventory() function. Should I declaare and define it in Character class? If yes, what should go in that function? I’m not sure but it seems like there is an issue when populating the array. Any ideas? otherwise it seems to work fine as I’m able to euip and drop items, but I’m not understanding why this issue sometimes happens. I can replicate it after a few minutes each time I hit play. Chances are that you’re attempting to access a null pointer. Try to use multiple “if” statements each time you’re accessing a pointer and assign a console message for every “else” statement (so you know which code block has failed). This method will eventually show you the culprit.